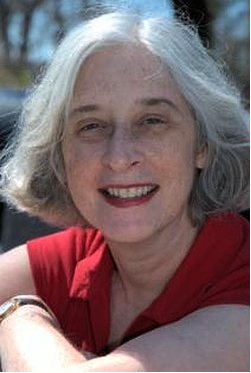 Stephanie Cowell and I have corresponded on Facebook for quite a while, and I had the delightful opportunity to have lunch with her at the Historical Novel Society conference held in June 2015 in Denver. 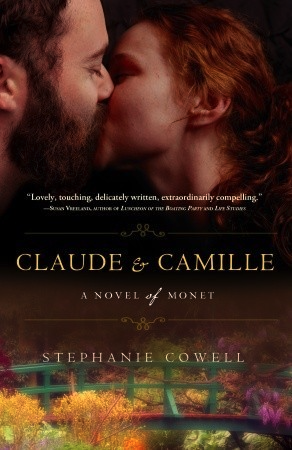 I also have a signed copy of Claude & Camille: A Novel of Monet, Stephanie’s most recent novel which tells of the early life of Claude Monet and his wife and muse Camille. I can recommend it highly! For me the characters and place in historical fiction need to be as real as anyone you know today or anyplace you go. People back then faced just the same problems as people do today only in a time when you relied on coal fires, or candle or oil light, and what you wore was different or how often you washed your hair or what sort of ink you used. When I wrote Claude & Camille: a novel of Monet, I saw the 25-year-old Monet’s struggles to be the same as anyone faces in the arts today. He was trying so hard to make a living and also be the provider for the girl he loved, and everything kept falling apart for him. I have always been close to people struggling to make it in the arts and it’s the same for all of us: the pain, the stubborn belief, the uncertainty. I think the main difference is the physical circumstances in which they lived and the rules which they had to obey. You could get thrown out of society or lose your crucial job for saying or being the wrong way. Also…the writer has to do a lot of research. I have never had to research what a bagel tastes like; I know that! A few centuries ago someone had to get up two or three hours before other people to make a fire and cook the porridge. No microwavable just add water packets! In my novel Marrying Mozart, Mozart and his mother have no fire in their bedroom fireplace to save money so they had to dress in the bitter cold. Well, all my novels are about people in the arts or spiritual seekers or scientists, so I have to do a lot of research for those things. People felt as we do; they just didn’t do it in the same circumstances. For example, there were candles and candleholders left on the ground floor of any house and you had to light one after dark to climb the stairs which were pitch black at night, unless you were wealthy and had candles or gaslights around. I think you have to know what the people believed and thought for plot and conflict. For a girl from a good family to lose her virginity before marriage could be tragic. In pre-Darwinian times, almost everyone believed in God and hell and the afterlife. Dialogue is the hardest thing. My first novels were Elizabethan and I had a great editor and publisher behind me (W.W. Norton) and I plunged ahead with Elizabethan slang and dialogue. When I put my first novel Nicholas Cooke on Kindle, I toned down the dialogue. Some people adored it and some were bewildered. What aspects do you feel need to be included when you are building a past world for your readers? Oh just hundreds of small things to make the reader know they have gone through a magical door and found another world. This is what makes Mary Renault so brilliant; her characters think as they did back then and have the expectations and limitations of that era. Where you have to tread carefully is that sometimes people “back then” did things we can’t tolerate now and perfectly nice people believed that Jews or black people were lesser or a little suspicious. I think the hardest thing to handle is moral attitudes. No, I think it is an enormously varied field. I mean we have the whole period from cave man days to 1980 and it’s all called historical fiction and comes in romance, adventure, literary, mystery etc. or a combination of everything else. I think it would be hard to sell a new novel on Anne Boleyn but I thought that years ago and along came Hilary Mantel! Well I have three of four novels near completion. Sometimes I will write a novel in a year and sometimes it will take twenty years or more. The last several years have been a bit unpredictable for me artistically. My last published novel is Claude & Camille: a novel of Monet about the young Claude Monet and his struggles to make a living from his art and make a peaceful life with his beloved Camille who can be a very troubled soul. The next novel….well I can’t say which will be the next one published but the next completed will likely be Robbie: an Edwardian Love Story, set in the English midlands, a love story between a 17-year boy artist and a brilliant, troubled man in his 30s who is trying to face his failed marriage and brutal childhood. The young man will grow up to be the stronger one and the older man will have to learn to trust. It’s a very intense novel, very passionate. So I think that’s next. Many thanks for sharing your perspective, Stephanie. I’ve highlighted several items that stood out for me. M.K. Tod writes historical fiction and blogs about all aspects of the genre at A Writer of History. Her latest novel, LIES TOLD IN SILENCE is set in WWI France and is available from Amazon, Nook, Kobo, Google Play and iTunes. Her debut novel, UNRAVELLED: Two wars. Two affairs. One marriage. is also available from these retailers. Mary can be contacted on Facebook, Twitter and Goodreads. I fell in love with Nicholas Cooke years ago and watched in agony for the next in that series. I’m glad now to have met you , Stephanie, at the HNS Denver Conference and to know the third book will be coming. Of course, I’ll go back and reread the others as well as your subsequent books. Becoming a published writer myself has opened the door to meeting many of my author heroes. Yay! Thank you so much, Elaine! I am afraid completing the last Nick book (very far on its way) got trumped by a few other things but next year I hope…thanks again for your very very kind words! Good luck with your own work! Thank you for these good thoughts about weaving human feelings that are the same under changing circumstances, Stephanie, and thank you for the great questions, Mary. I love that candle at the bottom of the staircase. And I also can’t recommend enough Claude and Camille: love and art! Thanks very much! I once took a class with Madeleine L’Engle at night in a chapel and she turned off every light and had only one candle. She said, “This is the darkness people faced for thousands of years; without starlight and the moon at night, this was it.” It was a very awesome moment.